At the CCL Northeast Regional Conference luncheon held at Regis College in Weston, Mass. 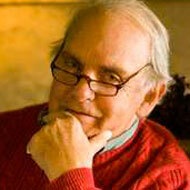 on October 27, 2007, Roger Lundin delivered the following tribute to Frederick Buechner. As we honor Frederick Buechner with the Lifetime Achievement award of the Conference on Christianity and Literature, we are profoundly grateful that he came upon this open door and that he stepped through it to become one or our most accomplished contemporary writers and a most compelling witness to the beauty and mystery of Jesus Christ. The volumes of Frederick Buechner’s memoirs — The Sacred Journey, Now and Then, Telling Secrets, and The Eyes of the Heart — tell the story of the difficult years that led up to that day of great laughter and of the extraordinarily fruitful decades that came after it. They speak of his enchanted and afflicted childhood, marked by the loss of his father, which in an instant carried ten-year-old Fred from the world of “once-below-a-time” into that of “once-upon-a-time.” Those works also tell of his education at the Lawrenceville School and at Princeton, of his decision to become a full-time writer and of his discovery, in his words, of “the possibility … of a life in Christ, with Christ, and on some fine day conceivably, even a life for Christ.” The memoirs document his theological training at Union Seminary and speak of his discovery of another love: “I fell in love. I got married. Beyond that I will only say, with John Donne, that ‘all measure, and all language, I should passe,/ Should I tell what a miracle she was.” From New York, the newly-ordained Presybterian minister and his wife Judy moved to Exeter, New Hampshire, where he taught and preached for a decade and where they welcomed three daughters into the world. Then it was on to rural Vermont, where Fred and Judy live to this day, and where he has written almost all of the books for which we honor him today. At the same time, while Frederick Buechner’s apologetic writings show him to have the ear of Friedrich Schleiermacher, his novels speak boldly in the voice of Karl Barth, Schleiermacher’s only peer among the Protestant theologians of the past two centuries. “For the most part,” Buechner says, “it is in only in my novels that I have allowed myself to speak unreservedly of what with the eyes of my heart I have seen.” From the ruins of postwar Europe, Barth wrote that the miracle of the gospel is that “we are not left alone in this frightful world. Into this alien land God has come to us.” And God does indeed come to Frederick Buechner’s characters in many alien ways: Godric spies the face of Christ in a tree’s leaves and sees them as lips soundlessly calling his name; Antonio Parr envisions Christ as “the Lone Ranger thundering on Silver across the lonely sage”; and the scrawny Brendan sees angels spread across the heavens and hears in their singing the mercy of God – these characters, Buechner concludes, “are all of them telling my story,” and they are living out their faith with a “kind of holy recklessness” to which all of us might aspire, however far short of the mark we may fall. How great is the laughter and how unspeakable are the sorrows that accompany these pilgrims every step of the way! Those sorrows run deep in the vein of life for Frederick Buechner and his fictional friends, but in the end, they are not as deep as the laughter nor as tenacious as the love it reminds us of. Here again, Karl Barth comes to mind. “Inevitably the man honored by God finds himself extremely odd as the object of that esteem,” Barth notes in the Church Dogmatics. Did not Sarah and Abraham laugh, he asks, when they received the promise of Isaac’s birth? “And was their laughter merely unspiritual laughter? [After all], is not the contrast between humans and the honor done them by God too great for us to take ourselves ceremoniously, and not laugh at ourselves” as the bearers and possessors of this honor?